Ciudadanos, Podemos and the Socialists (PSOE) won’t be able to guarantee stability in Spain, according to Antonio López-Istúriz, Secretary General of the centre-right European People’s Party (EPP). In view of the general elections, to be held on 20 December, only the “experience” of the right-wing Partido Popular in “managing crises” can be trusted, López-Istúriz told EURACTIV Spain. Antonio López-Isturiz is Secretary General of the European People’s Party (EPP). He spoke to EURACTIV’s Fernando Heller, ahead of the EPP Statutory Congress in Madrid (21-22 October). López-Isturiz spoke with Fernando Heller. Does the Partido Popular (PP) assume that it won’t win back its majority, and that negotiations with Ciudadanos, which polls foresee taking 21.5% of the vote, are inevitable? Not at all. I think that the so-called emerging parties in Spain (Podemos and Ciudadanos) have a problem of self-definition and political identity. For example, voters do not really know what Ciudadanos is. I am afraid we will only discover if they are center-right or center-left if they get a good result at the elections. The PP is clearly defined. We are centre-right. We have a crystal-clear identity. Above all, we have experience in managing a country, experience in managing two crises (1996 and 2006). Certainly, we had to undertake difficult austerity measures, but now we see the first tangible results. The country is on the path of recovery. But we need continuity, to end the job in the next four years. You mean that only the PP is able to secure a recovery? Indeed. The recovery in Spain is tangible. But many international investors and rating agencies are waiting for the elections to see what they will do, depending on the results. Strange experiments in politics are usually not welcome. A victory for Podemos would be very negative for the country. It would be disastrous for Spain, due to their lack of experience in politics. But this is also valid for Ciudadanos. The PP’s political opponents say that even if macroeconomic figures are positive, they are not having a direct impact on the most vulnerable. Is it a weak recovery? I would certainly not say it’s a weak recovery. It is a very solid one. And this is not just my personal opinion. European and International institutions (including the IMF) are also saying that. Let´s not forget that Brussels has often failed in its forecasts for Spain. The European Commission said Madrid should make additional efforts to meet its deficit targets for 2015, as well as for next year. We are always beating forecasts. I am convinced that we will also do so this time. Are the efforts already done enough? We still have a high level of unemployment (more than 22% are jobless), in particular a high rate of youth unemployment (almost 49%). Sure, there is a lot of work to do. Let’s not forget that we have still several reforms on the table, which must be implemented in the next four years. The recovery is solid, but the efforts need continuity. The Spanish left says that Mariano Rajoy and the PP have neglected social policies, and dramatically cut Spain’s welfare state. Is this assessment correct? It is totally false that social policies in Europe are exclusive to the left. 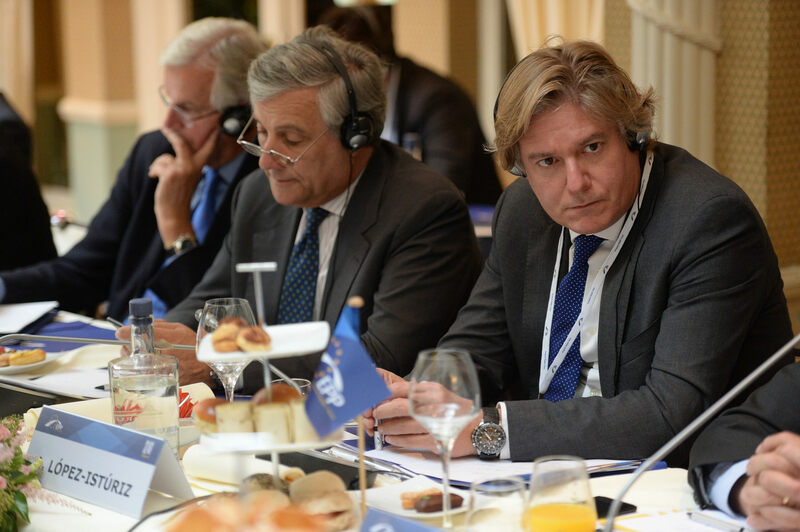 Those who have created more jobs and more labor rights in Europe belong to the EPP family. There are many examples of this across the EU: Germany, Ireland, Spain, Portugal, and Greece: until (Alexis) Tsipras´s victory. Unfortunately, many Socialist governments, including in Spain, have been characterized by public deficits, which have subsequently created high unemployment rates. Before Mariano Rajoy came to power, Spain’s deficit was at 9 points, and unemployment reached record levels. The same happened with José-María Aznar in 1996. He inherited a huge public debt created at the time of (Socialist) premier Felipe González. This is the paradox of the left. They call themselves “social”, but they are not even able to guarantee worker’s rights. Spain has found a new way to deal with migration, cooperating with transit countries such as Senegal, Morocco and Mauritania. Should the EU follow the Spanish example? Indeed, we are somehow paradigmatic. But let’s be honest and not forget that this was a long-lasting effort and we were alone in the race. We had to defend alone, by our own means, the border in Ceuta and Melilla (Spanish territory in northern Africa). But this not only a Spanish border, it is a European border! We have also been asking for more funds for FRONTEX and for development cooperation and assistance, in particular for the UNHCR to work in refugee camps in Jordan, Turkey and many other transit countries. All our demands were right, and are currently being implemented on the ground. We were pioneers. I would certainly encourage Renzi and Tsipras, because they are confronted with the same problems, to assume their responsibilities, defend their borders, and sign agreements with countries of origin and transit, as we did. Many EU citizens, NGOs and other civil society organisations are worried about the consequences of the TTIP agreement with the US. Is that fear justified? Criticism of TTIP comes mainly from anti-US groups. Negotiations always involve complex compromises and difficulties. But with TTIP, all European values and standards are protected, including the agricultural chapter, and also the “cultural exception” raised by France. We, in the EPP, think that TTIP brings many opportunities to create jobs and wealth on both sides. We shouldn’t miss this opportunity. “Antonio López-Isturiz” known to his mates as “moron” – tell me how is the 50% youth unemployment in Spain doing? is that what you call managing a crisi? – you sir are a stain on humanity and a living affront to the human race.